Regardless of how smoothly things seem to be going before the students return at the library where I work, something always happens to muck up the works. It is generally fixable – sometimes the problems are easier to resolve than others. However, stress abounds for me at this time of year. Today, imaging machines in one of our labs is just not working as hoped. I’ve given up for the day in hopes that tomorrow will be filled with a greater measure of success. Sadly, that may be unrealistic. But, I’ve had all I can take today. So, I’m turning to those things that make me happy for some amount of peace – my Han Solo and Princess Leia wallpaper – and my picture of a Stormtrooper helmet. 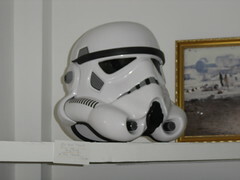 The helmet is from Nick Malley’s The Yoda Guy Gallery in Saint Marten. Mike & I were lucky enough to meet Mr. Malley on our last visit to Saint Marten. Very cool!! This entry was posted on Tuesday, August 21st, 2007 at 3:57 pm and is filed under personal reflections, pictures. You can follow any responses to this entry through the RSS 2.0 feed. You can leave a response, or trackback from your own site.